Dates of birth and death unknown. Disciple of Takeshima Kôzaemon I, he started his career as a wakaonnagata in the 1st lunar month of 1700 in Ôsaka, where he performed in the new year drama "Rishô Monogatari" which was produced by Takeshima Kôjûrô. He played in Kyôto in the 11th lunar month of 1710 the role of Tsuneyo's nyôbô Naniwa in the kaomise drama "Tagasode Ume Sakura Matsu" (the role of Sano Genzaemon Tsuneyo was played by his master Takeshima Kôzaemon I). 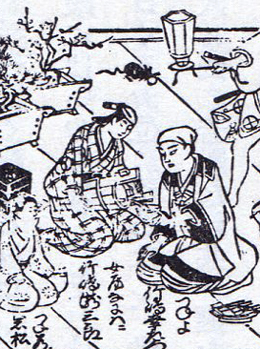 Takisaburô's rank in the 1711 Kyôto hyôbanki, wakaonnagata section, was jô-jô-(shiro)kichi (superior - superior - (white) excellent) [visual]. He was active in Kyôto up to the 11th lunar month of 1713. No record afterwards.